IT’S Australia’s priciest car space — and it’s on the market for a cool $330,000. The same amount of money would snare you a two-bedroom villa, complete with backyard entertaining area, airconditioning and lock-up garage, in a complex at Colyton, in Sydney’s west. The extravagantly priced CBD parking space is in the basement of an exclusive apartment complex on the corner of Bond and George streets, where congestion and high-density living have made parking scarce. Owner Terence Chua said the parking space is one of the few in the CBD with its own title, allowing the owner to use or rent it out without living in the building. Andrew Duggan would rather pay an astronomical price for a carpark than park on the street. Other car spaces in the area have tended to sell for already lofty prices in the region of $150,000 to $200,000, but Mr Chua said the $330,000 price tag reflects the fact that the space is slightly longer and can fit two cars if one parks behind the other. “It’s a handy spot and it gets good rent, but most of the people interested want to use it for themselves. People who live in the CBD know it’s almost impossible to find permanent parking,” he said. Figures from car park listing portal findacarpark.com.au show the record for a Sydney car space sale is $250,000. The portal also revealed that parking spots on George St attract more online hits than any other street in Australia. Founder Francis Armstrong added that the average price for a Sydney parking space is $73,000, but said he would not be surprised if the record and average price were soon smashed. “Councils are encouraging new high-rise developments to be greener and now restrict the number of allocations for parking. The population is increasing, but the amount of parking isn’t,” he said. Parking space owners who lease their spots out can expect to receive between $400 and $800 a month in rent, on average, with average rents on Bondi spaces the highest in the city at $897, followed by the CBD at $685. Sydney’s well-heeled say they’d rather stomach rising parking prices than consider the alternatives. 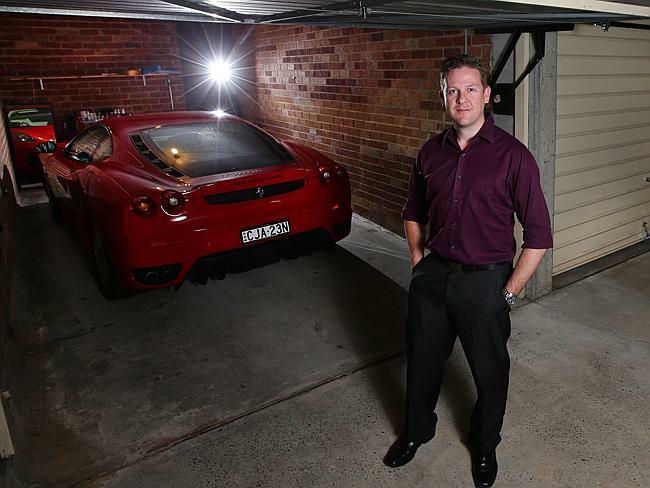 Apartment resident Andrew Duggan rents a garage for his Ferrari and said if given the option he’d rather pay astronomical garage prices than park on the street.